An Ecologist from North Carolina, Melissa, breaks down one of our favorite Research Papers. This paper, from the Journal of Biogeography, presents ENMs for Sasquatch. They base their ENMs on putative sightings, auditory detections, and footprint measurements primarily obtained from the Bigfoot Field Researchers Organization (BFRO). The best thing about this post is she briefly explains, in layman terms, what software was used and how it was used. She also does a great job explaining expected results and conclusions. North Carolina, Feburary 6, 2011 (Science Storiented) In the science of Sasquatch it's all about distribution. Where is he (or she) and how can I get a photo? The photo I'll leave up to you, and hope you are good at keeping your camera steady to avoid those embarrassingly blurry pictures. The where is he part can be figured out by utilizing user-friendly software, publicly available biodiversity databases, and ecological niche modeling (ENM). A scientist named Grinnell proposed the ecological niche concept in 1917, so it isn't new. Overall, it's pretty simple. Each species needs a specific set of conditions to survive. The range where these conditions occur is where a species can maintain a population. Since 1917 the concept has been expanded, most notably by Elton in 1927 and MacArthur in 1972, to include a species as part of an ecological community. With this type of model it is possible to characterize the ecological needs of a species, predict and anticipate it's distribution, predict changes in it's distribution with changing land and climate, investigate patterns of speciation and niche divergence, and build scenarios for unknown conditions and behavior. "The basic premise of the ENM approach is to predict the occurrence of species on a landscape from georeferenced site locality data and sets of spatially explicit environmental data layers that are assumed to correlate with the species’ range." That's how the paper I'm presenting today describes it. What does it mean? Input known, locally collected data and make reasonable predictions of species occurrences given the current modelling technology. That known, locally collected data is becoming more and more available and accessible via museum databases and online data portals. Sasquatch, or Bigfoot, is currently (pseudo-)classified as a member of a large primate lineage descended from the extinct Asian species (Gigantopithicus blacki), but there is some phylogenetic analysis indicating a possible membership in the ungulate clade. Regular reports have Sasquatch inhabiting the forested lands of western North America, although a type specimen is unavailable. This paper, from the Journal of Biogeography, presents ENMs for Sasquatch. They base their ENMs on putative sightings, auditory detections, and footprint measurements primarily obtained from the Bigfoot Field Researchers Organization (BFRO). Events were assigned geographic coordinates on USGS quad maps and atlases and the ENMs constructed using the maximum entropy niche modelling approach using the software MAXENT. Then environmental layers were constructed for 19 BIOCLIM variables in the WORLDCLIM dataset. The final set of environmental variables included annual mean temperature, mean diurnal range, isothermality, temperature annual range, mean temperature of wettest quarter, mean temperature of driest quarter, precipitation seasonality, precipitation of driest quarter, and precipitation of coldest quarter. 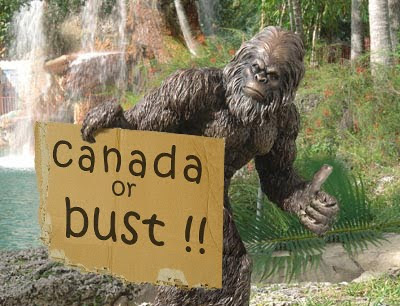 The ENM showed that Sasquatch should be broadly distributed in western North America, with a range comprising such mountain ranges as the Sierra Navadas, the Blue Mountains, the Selkirk Mountains, and the Cascades. The bioclimatic variable that was the best predictor was precipitation in the coldest quarter. And so, it is likely that the distribution will be altered due to global climate change. Running with that result, the scientists examined the potential ramifications of climate change on remnant Sasquatch populations to predict how the frequency of sightings might change in the future. To do this they projected ENMs generated from the WORLDCLIM data into bioclimatic layers simulated for a doubling of atmospheric CO2. The model predicts that Sasquatch will abandon lower altitudes and lose habitat in coastal regions. But the species will potentially gain habitat in the northern part of the range as well as in several other montane areas. This means that, in the future, you should expect to sight Bigfoot in northern latitudes and at higher elevations. Another suggestion: Look for American black bears (Ursus americanus) and you may sight Sasquatch. Now, I'm not advocating lurking around bear dens or walking right up on a black bear, but the predicted distribution of Sasquatch is similar to the range of the American black bear. So much so, that it is thought that some Bigfoot sightings were, in fact, misidentified black bears. Up for a hike in California? Bring your camera. Very cool paper. Thanks for sharing that insight. Sadly, it looks like the article itself has a sarcastic tone to it.